The Welsh Hamper Company was founded in the year 2000. We are the longest serving Hamper Company in Wales, a family run business with 18yrs experience. We provide hampers to blue chip companies, exclusive stores and individuals looking for that special gift. Our success has been built on providing quality Luxury Welsh hampers for all occasions, together with excellent service which ensures our customers come back year after year. We are the Original Welsh Hamper Company in Wales where you will find a range of top quality hampers that are filled with mouth-watering Welsh Produce. Only the finest local companies have been selected for their wholesome ingredients to capture that traditional homemade taste, many gaining great taste awards for their produce. The products we offer are sometimes in short supply and are more likely to be found in specialist food festivals than the local supermarket. The Welsh Hamper Company is based in the Vale of Glamorgan and only 15 miles from Cardiff City Centre, our range of hampers are excellent value for money and we aim to provide a quality service to both our corporate and personal clients. The London Evening Standard voted the Welsh Hamper Company one of the best Christmas Hampers. Wales Online voted us in 9 of the best Christmas hampers for every budget! If there is something you have in mind, which is not on the website, please let us know. All hampers have an enclosed card from the Welsh Hamper Company which can include your personal message. 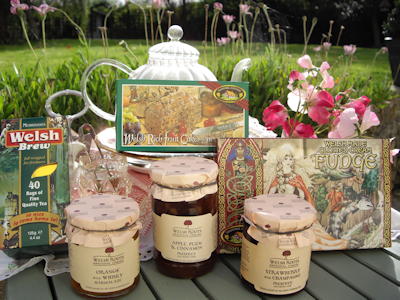 We offer Beautiful Welsh Hampers throughout the year for all occasions, select your delivery when placing your order! Christmas is also a wonderful time to celebrate Welsh food, we are the Original Welsh Hamper Company providing fantastic Welsh food hampers from Wales. Christmas orders are taken from September onwards.